The time worn custom of observing Saturday, or part of it, as a holiday has almost become a law in the South, especially among farmers. 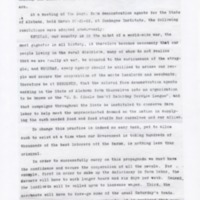 WHEREAS, our country is in the midst of a world-wide war, the most gigantic in all history, it therefore becomes necessary that our people living in the rural districts, many of whom do not realize that we are really at war, be aroused to the seriousness of the struggle; and WHEREAS, every agency should be utilized to arouse our people and secure the cooperation of the white landlords and merchants; therefore be it RESOLVED, that the colored farm demonstration agents working in the State of Alabama form themselves into an organization to be known as the "U. S. (Uncle Sam's) Saturday Service League", and that campaigns throughout the State be instituted to conserve farm labor to help meet the unprecedented demand on the nation in supplying the much needed food and feed stuffs for ourselves and our allies. To change this practice is indeed no easy task, yet to allow such to exist at a time when our Government is taking hundreds of thousands of the best laborers off the farms is nothing less than criminal. In order to successfully carry on this propaganda we must have the confidence and secure the cooperation of all the people. For example, first in order to make up the deficiency in farm labor, the farmers will have to work longer hours and six days per week. Second, the landlords will be called upon to increase wages. Third, the merchants will have to fore-go some of the usual Saturday's trade. Unless the three above agencies coordinate, it is realized that very little can be accomplished. "Win the War by Working Six Days Per Week"
EXTENSION SERVICE OF THE A. P. I. US Saturday Service League, “Win The War by Working Six Days per Week,” 1918 April 2, TI00246, Race and Segregation Collection, Woodrow Wilson Presidential Library & Museum, Staunton, Virginia.